172 pages | 16 B/W Illus. 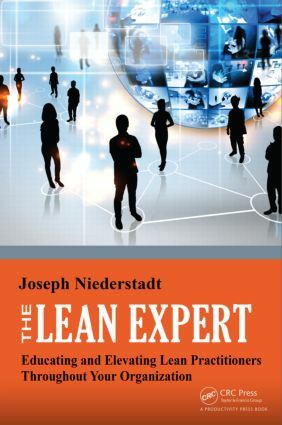 The Lean Expert: Educating and Elevating Lean Practitioners Throughout Your Organization outlines amethod that can help organizations engage associates and empower them to achieve "expert status" in the nine core principles of Lean. By implementing the Lean Discipline Expert process detailed in the book, companies will demonstrate to their associates that they believe they are the organization’s greatest assets, while empowering them to make lasting improvements to the organization. The book provides a robust and proven process for creating a Lean culture. It outlines a method, with defined steps, for the development of Lean Discipline Resource People that will help associates achieve "expert status" in the core Lean principles of 5S–Visual Management, Value Stream Mapping, Standard Work, Total Productive Maintenance, Quick Changeover, Error Proofing, Process Problem Solving, Material Management, and Continuous Improvement. You will be able develop Lean strategies, create a Master Schedule, initiate activities for supporting goals and objectives, and complete a Train-the-Trainer class as well as achieve facilitation skills to teach, communicate, guide, and lead Lean overview training as well as comprehensive subject-matter training. In addition, you will understand how the Lean Discipline Expert process can help to support associate involvement at all levels and learn where and how the nine principles overlap and interact. By engaging and empowering various levels of associates throughout the organization, you will provide strength and ownership for your business and, most importantly, your associates. The book includes access to additional resources on the book’s page at www.crcpress.com. It includes a tracking mechanism for monitoring candidate progress, facilitation feedback forms, LDE checklists, and certificates of accomplishment you can use to acknowledge associates that achieve Lean Discipline Expert status. Joseph Niederstadt was born in Saginaw, Michigan, in the early 1950s. This was a town that depended heavily on the automotive industry, as did many towns during this time period. Industry was booming, and mass production was well on the way. The automotive industry employed tens of thousands in the area, providing a standard of living for those working in the factories that few have ever seen or probably will see again. Like many others in the area, Joe started work in a General Motors factory with the goal of making money and providing benefits for his family yet to come. He never realized that it was the beginning of a career in manufacturing that would span beyond 30 years. His experiences include furnace operator in a foundry, where one job was to rebuild the lining of an electric induction furnace 20 feet from the surface using a 90-pound jackhammer in 100°+ heat (on many occasions, the heat would cause the wood forms he was standing on to catch fire!). Later, he worked at Chevrolet Motor Division and Delphi as an assembly line operator; a water spider on an assembly line; and later moved on to supervise machining, assembly, after-market operations, quality control, production control & logistics, labor relations, Lean core team, supplier development, and international assignments. During this progression, Joe has never forgotten his roots as an operator and has always strived to make the work environment better for the operator. He has lived through the transition from mass to Lean production, from the "do as I tell you" mentality to a team-managed work system, from massive inventories to Just-in-Time philosophies, from "run all you can every time you can" thinking to Pull systems, from dedicated equipment to flexible cells, from changeovers that took days to those that now take minutes. The list goes on and on. He has been taught by several Senseis from Toyota and some of the best Lean people at other globally renowned and recognized businesses. Joe not only utilizes this training, teaching, and experience in his work, but he has also applied it to his first publication, Standardized Work for Noncyclical Processes(CRC Press, 2010), and to this book as well. Joe has successfully launched Lean journeys and implemented Lean applications throughout the United States, Canada, Mexico, Brazil, Taiwan, India, Korea, China, and Thailand, applying the Kamishibai system presented in this book. He is currently the owner and independent Lean Practitioner at Gemba2win LLC. In his first book, Standardized Work for Noncyclical Processes, Joe provided the reader with a methodology and tools to collect and see data about process waste that is generally overlooked. It is geared for those who wish to take their attack on waste to a new level. In his second book, Kamishibai Boards: A Lean Visual Management System That Supports Layered Audits(CRC Press, 2014), he provided a simple way to see "normal" versus "abnormal" quickly and easily; presented a tool to maintain standards or identify what needs to be returned to standard quickly through visual management; outlined a system to engage all levels in an organization; and described a layered audit process to sustain your organization’s implementation of Lean. In this book, Joe has laid out a process for creating an army of Lean resources for any organization that is willing to make an investment in their associates and a commitment from their leadership. Remember, your competition hopes you will do nothing! You can find out more about Joe by viewing his profile on LinkedIn.